Please welcome Sara from My Imperfect Kitchen. Sara cooks meals that are fun, full of flavor and color and all around delicious. She is a dear friend who I think you will love! Make sure to visit her on Facebook as well! We've loved these Buffalo Turkey Burgers since we first saw them in Rachel Ray's 365 Days No Repeats Cookbook. 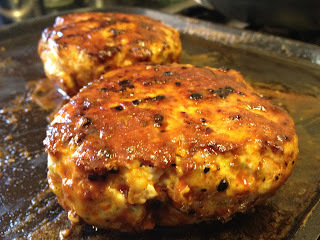 Over time, we've modified them to fit our tastes, but they're still our hands-down favorite way to make turkey burgers! Simple ingredients make the taste of the turkey shine through. It's like Buffalo Wings on a bun! One taste and you'll be hooked too! 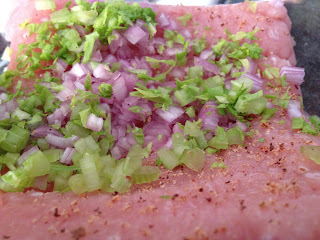 Start with a pound of ground turkey meat, some diced shallots, finely diced celery and a little ground nutmeg. Shhhhh, it's the secret ingredient! It adds that "this is good, but I can't quite place the flavor" element. Yep, that's it. Just four ingredients for these fabulous burgers! Shape them into patties. A pound will make four nice patties. We only made three this time. I won't do that again, they were just too big! We season them with McCormick Montreal Steak Seasoning and grill five minutes per side. Now, the not-so-healthy part of this equation. Melt equal parts butter and Franks Buffalo Wing sauce in a small pan over low heat. Once everything is melted, take the cooked burgers and coat them in the hot sauce mixture. Alternately, you could grill the burgers and simple top them with Franks Hot Sauce, leaving out the butter, but really... why would you do that? Butter makes the world better. The toppings are simple too! A bit of blue cheese dressing on the bun, lettuce and red onion. It's a Buffalo Turkey Burger after all. I think blue cheese dressing is a requirement! Serve them with a side salad or cut up carrots and celery! Perfect for a summer night when you're craving something spicy and a plate of hot wings just won't do it. Mix the first four ingredients together in a bowl and shape into patties. Sprinkle seasoning mix over the burgers and grill over medium heat for five minutes per side. While the burgers are cooking, melt the butter and hot sauce together in a pan. When the burgers are finished, coat them in the hot sauce mixture. 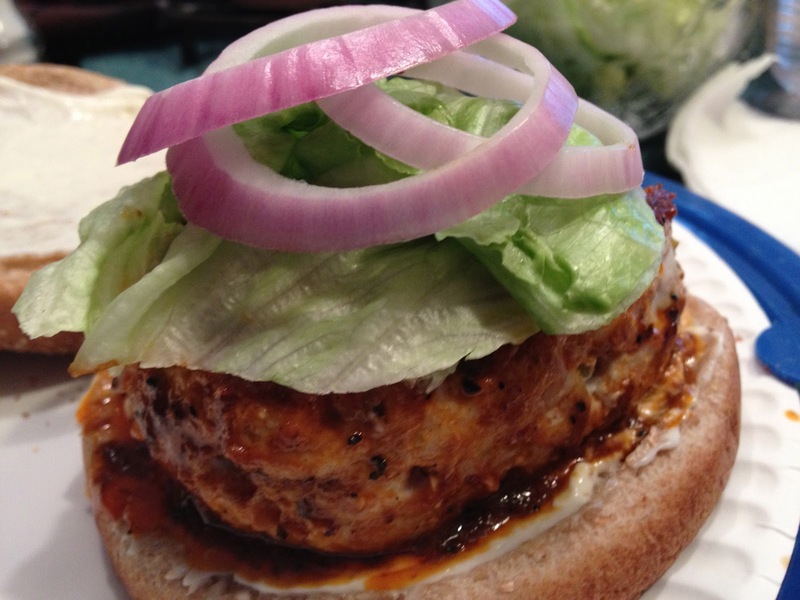 Serve on whole wheat buns with blue cheese dressing, lettuce and red onion slices.